I have been gardening for over 10 years in the traditional garden beds (large tracks of tilled dirt on the ground). Most of those years we have limited ourselves to tomato, pepper, onion, and peas. We are branching out more this year as you can see. Sweet corn has always been a issue growing in past years, hoping the raised beds make a difference this year. The soil composition is going to be 1 part screened top soil, 1 part concrete (play) sand and 1 part compost (free from landfill) as our soil here is heavy clay based. So will be mixing 9 ton of gardening soil for the beds and other projects around the yard. If you guys see any issues with the layout plan please let me know. I have seed ordered and per the company shipping out today. Once I get the seed I will be starting the tomato and peppers in egg crates (paper) right away so they are ready for transplanting around june 1st or so. Just a note the tomato are Heirloom Red Brandywine and per the company they are a vining type tomato so those that vine and need support with have it, you will noticed those marked supported in my chart are those items. Thank you everyone and happy gardening in 2012. Sorry to be so late on updating my garden results. We have been busy with friends and family issues most of the year. In review i did 4 raised beds, a 18 gal muck bucket (blueberries) deck ground planter (raspberries) and a strawberry bed. beds consisted of screened dirt, manure from a farm (horse, cow, sheep) and playbox sand. Blueberries – did some growing this year, not expecting anything till possibly 2013 or 2014 on them. Currently in muck bucket, if they survive will move them to a spot in the yard or the top tier of the strawberry planter since the flower bulbs I planted did not come up at all. Raspberries – did get a few (handfull) of berries, plants did well considering a pack of puppies terrorized them before I could get wire up around them. expect more in 2013 as it will be the second year they and the blueberries are in. Watermellon – grew ok, had to replant a couple that the rabbits got. Had 1 good watermellon comming but lost due to a mouse that took 2 weeks to get. Will do 2 plants only this year and see if any better results. Cantaloupe – not happy with the variety, did not produce what the description said on package. not sure if will try again or not. If so will get the regular sized and not the mini (individual sized). Corn – better then in years past, not enough nitrogen. Planted 4 to a square foot. Grew great (4-5 foot tall) but only produced 2-4″ ears. not sure if will try again. Broccoli – did excellent, 8 plants produced a gallon 1/2 bag. will do them again. Purchased plants uptown instead of from seed. cabbage – plants from up town, planted 4 green and 4 red, got 8 heads total nice sized. will do the same this year. Cucumber – did great, will go back to straight eights, the seeds I bought did not impress me. Onion – may have planted to early and to deep, very little bulb growth but many seeded out, harvested seeds for both the white and red onions. Left in ground over winter, if they come up they come up, if not will seed or put new bulbs in. Green peppers – this was the last year of trying them, did not produce much at all and all thin walled. not going to do them anymore. tomato – alot of plants did some good production after getting blossom rot, did beef master variety, ok but going back to beefsteak. will do same number all in a box to themselves, nothing else. Brussel sprouts did well, will only do 4 plants (did 8 accidently bought a extra 4 pack, thought I grabbed something different). thinking about moving three of the boxes and doing the inground plus the 4 boxes for more room and production. Three will be filled completely with the compost mix from our local dump (had dirt mixed in also). the other bed and ground garden area will be topped off with same mix. Just some hints for others, our local landfill takes leaves and yard waste and composts the stuff and offers it free to the community on a first come first serve basis. They also take branches and christmas trees and run them though grinders and offer mulch free also same as compost. Also try your local classifieds (newspaper, news stations, etc) or craigslist for free or cheap compost/dirt etc. 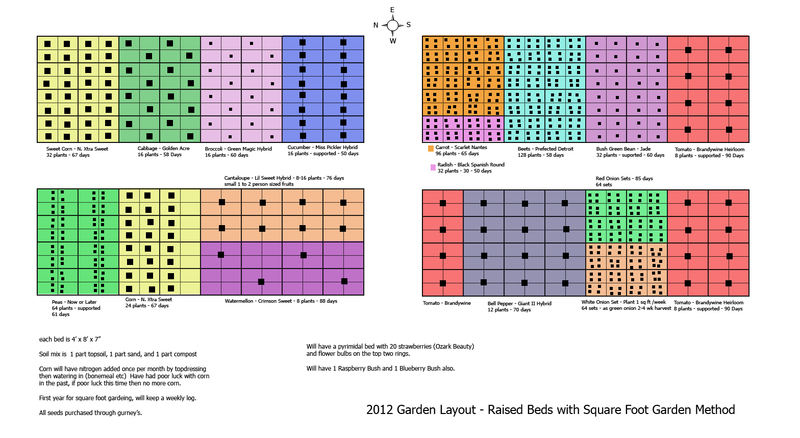 Would love to hear how your plan worked out, as i am building my first beds this spring!! Debora–A couple of posts I’d direct you to–about vertical support like cages, trellises, etc. Also, a unique way of supporting zucchini. My preference for cukes and peas is a vertical trellis. For tomatoes I like oversize cages (bigger than what you can buy at WalMart or Home Depot). 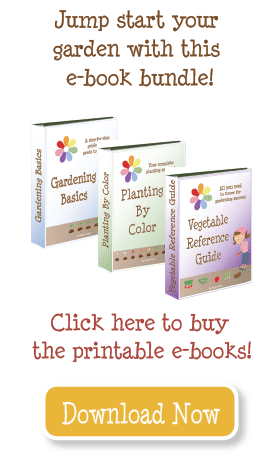 Here is a page with articles about starting seeds. If you’re a beginner, I don’t suggest starting seeds. Buy transplants or plant seeds directly in the garden. You can sign up for my gardening newsletter which tells you when to start/transplant/plant each veggie. I’m new here and also brand new to gardening. I’ve jumped in and have probably bitten off more then i can chew, but will know better for next year. I have 4 raised beds and my North is the same as yours. I am still a little confused about staking…. (ok….the entire gardening process, but will start with staking). I plan on doing cukes, tomatoes, beans and peas and was wondering what sort of supports you use and where the plant is vs where the stake is (inside,outside…..) Do you start your plants inside from seed, or get started plants from the nursery? Sorry if this is not the place to ask, but your post is the first one I see. In your two beds on the right on your garden plan, I’d put all the tomatoes on the north side. Otherwise, they’re going to shade out your other plants. If the beds aren’t already set-up, I’d orient them with the long side to the north, that way you’ve got more area for tall crops! here is a really good article about best corn production practices in South Dakota. There are hybrids of corn that do better in different areas than others in terms of resistance to disease, hardiness and other factors; also, you have to be careful about getting seeds from neighbors because they may not be good producers or they may have mold or other problems that you won’t be aware of. And corn, of course you probably know this, has to have full sun. As far as watering, it’s better to water twice per week heavily, than to water every day. Corn really needs water around the time it silks, and if there isn’t enough water there won’t be many ears. Also, look for little beetles to make sure you don’t have a bug eating the early corn. We did not have a garden last year at all. In 2010 it stayed to cool and to much rain took care of the corn (stunted the growth). In the past I have tried it and it grew good just no ear production at all. One year had these bug cut type worms/catapillars take the corn stalks/roots out also. I always rotate crops every year. The corn in the past is what I could find up town when buying seeds locally so have been burpee, gurney, even got some from some family members who farm and planted a couple acres of sweet corn. I try to stick with a straight yellow hybrid as I do not like the candy corn (not as sweet to me as the straight yellow) but have tried corn maybe 4 times in the last 10 years (when I could sneak it into the garden past the parents LOL). For watering we usually hand water everyother day by hand with a garden hose (unless it rains of course) I try to keep it at about one inch per week of rain/watering unless in the late summer where temps are around or over 95 deg f then we light water in the morning and later afternoon. The beds and soil mix are all new this year, we have the topsoil, and sand but the local landfill did not have compost available so I founds some manure that has been composting for 2 years per the farmer (does not look like it though). Dakota, tell us more about the problems you had with corn in the past. What hybrid, are you planting in the same place each year or rotating the crops, and when does the problem appear? What kind of watering system are you using? Also, are you rotating your crops this year – i.e. putting the individual vegetables in a different place than they were last year?